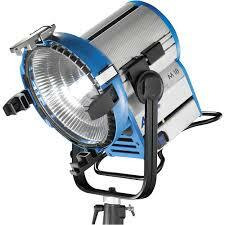 Following on from last week’s look at tungsten units, today we focus on HMI lighting. HMIs are more complex technology than tungsten, meaning they are far more expensive, and more prone to problems, particularly if you get a deal from a hire company and they give you older units. 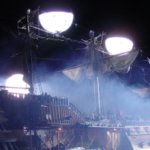 But they are bright and relatively efficient and because of this, and their colour temperature of 5,600K, they are by far the most popular type of light used in today’s film and TV industry when battling or mixing with natural daylight. HMIs (hydragyrum medium-arc iodide) operate by creating an arc between two electrodes. This arc excites a gas which produces the light. In order to ignite the arc, a ballast is required. This device also regulates the current, while a special header cable connects the ballast to the light. Ballasts come in two types: electronic and magnetic. Magnetic ballasts are cheaper, but if you are shooting at a shutter interval out of sync with the cycling of your power supply – e.g. 1/48th of a second with a 50Hz UK power supply – the HMI will appear to flicker on camera. Electronic ballasts have a ‘flicker free mode’ which converts the sine wave of the power supply into a square wave so that the arc does not extinguish at any point in the cycle. A side effect of this is that the head and/or ballast can produce humming, buzzing or squealing noises. Therefore many electronic ballasts have a ‘silent mode’ which reduces the noise but only prevents flicker at standard frame rates, not for high-speed work. In practice, flicker is rarely a problem as the shutter angles of today’s digital cameras can easily be tweaked to deal with it at common frame rates. Like tungsten units, HMIs are available in open face, par and fresnel varieties, though the open face models are not very common. 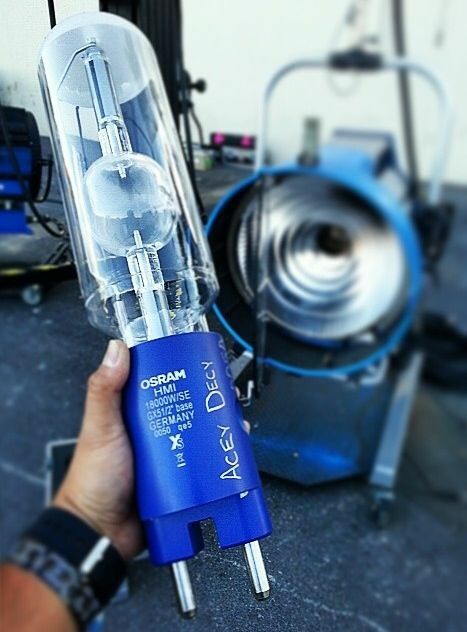 Arri, the major manufacturers of HMIs, call their daylight par fixtures ‘Arrisun’. Other HMI brands include Film Gear, Silver Bullet and K5600, which makes Jokers (see below). Measured by their wattage, standard HMIs sizes are: 200W, 575W, 1.2K, 2.5K, 4K, 6K, 12K, 18K. 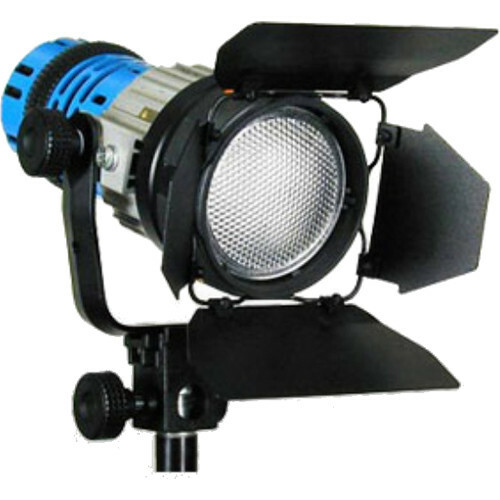 The smaller models, up to 2.5K, are fairly common on no-budget sets, because they can run off a domestic power supply and so don’t require a generator. At the other end of the scale, 18Ks are standard for daylight exterior and interior work on medium budgets and above. 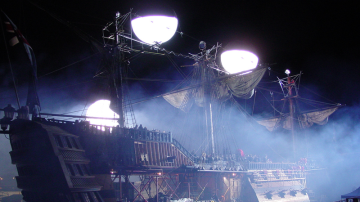 Because of their power, HMIs often play a key part in night exterior lighting too. A 12K or 18K on a condor crane may be used to simulate the moon, while other HMI units, perhaps bounced or coming through a frame, might serve as sidelight or fill. By choosing to shoot at 3,200K, you automatically turn these HMI sources blue, often a desirable look for nighttime work. There are many variants on the standard HMIs. Here are some of the more common ones. 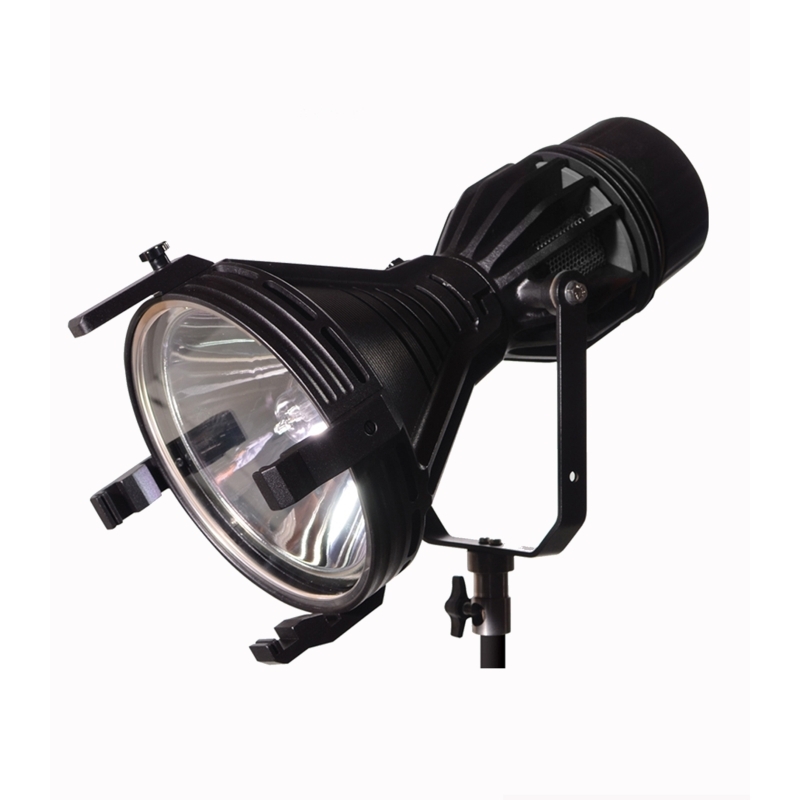 Pocket pars are little 125W daylight pars that can be run off batteries. 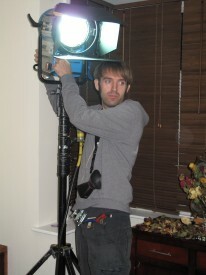 Before the days of LED panels, I used one of these for eye-light on a short film set in a forest in daylight. 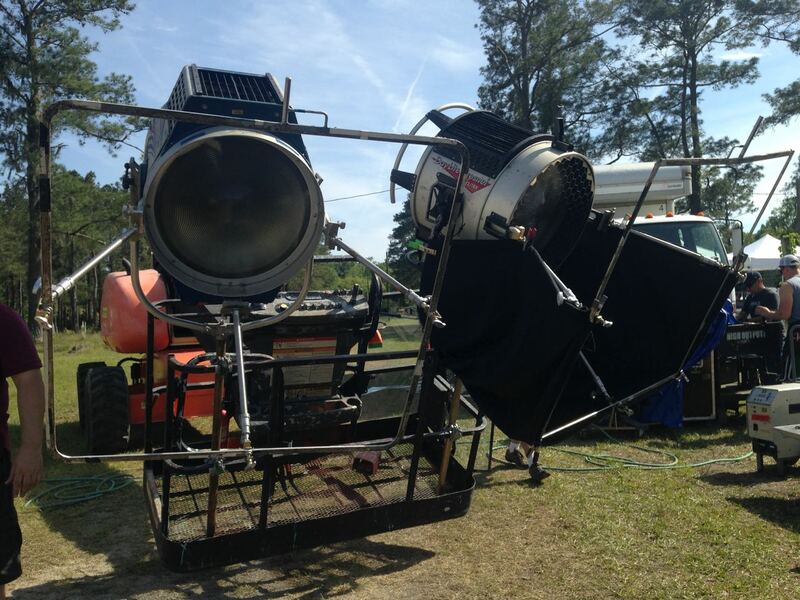 They can also make a good TV gag when bounced off a wobbling silver reflector. Jokers are small units that come in 400W and 800W models. They can be reconfigured in various ways and even slotted into Source 4 housings (see last week’s tungsten post) to convert these units to daylight. We used a 400W joker a couple of times on Heretiks, when there was little space to rig in but we needed a fair bit of punch – like daylight through a small window. 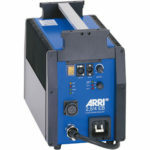 The Arrimax range uses a hybrid of par and fresnel technology. They are lighter and more efficient than standard HMIs – the 800W model puts out almost as much light as an ordinary 1.2K, for example – but they’re more expensive to hire and don’t create the nice shafts of light that some DPs like (ahem). The model numbers are the wattage in tenths of a kilowatt: M8 (800W), M18 (1.8K), M40 (4K), M90 (9K) and the anomalously-named Arrimax 18/12 which accepts both 12K and 18K bubbles. Helium Balloons are designed to provide a soft overhead illumination for night exteriors or high-ceilinged interiors. They come in a range of shapes and sizes, and aren’t necessarily HMIs; they can be fitted with tungsten lamps, or a combination of both. Again, please let me know on Facebook or Twitter if I’ve missed out any of your favourite units. Next week: fluorescents.